Marijuana growers are now able to do business legally in over 29 states. With marijuana legalization comes billions of dollars in revenue – something states are happy to collect. For example, Colorado's legal marijuana sales topped $1 billion last year. Producing just a few pounds of weed can have the same environmental toll as driving across America seven times, according to a June 20 report by The Guardian. So states are coming together to solve the problem – they still want to enjoy massive pot sales revenue, but need to drastically reduce these marijuana companies' enormous energy consumption. Since cannabis is still an illegal drug according to the U.S. federal government, growers and retailers are faced with several problems. They cannot get federal tax breaks for solar panels, for example; nor can they get organic certification from the USDA, according to The Guardian. "Some of the nation's hard-earned progress towards climate change solutions is on the chopping block as regulators continue to ignore this industry's mushrooming carbon footprint," said Evan Mills, a senior scientist at the University of California, to The Guardian. Until these obstacles are resolved, states and marijuana growers will have to work together on a way to curb carbon emissions. Fortunately, that's exactly what's happening right now. Take Denver, Colo., for example. The city's Department of Environmental Health has a carbon reduction plan in place to reduce emissions by 80% by 2050. But marijuana growers – who account for nearly half of the city's recent 1% uptick in energy use – are getting in the way. 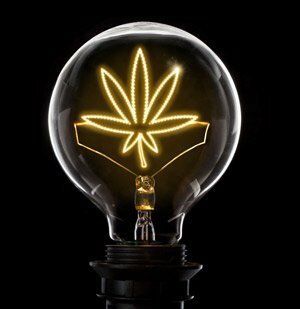 "Cannabis may still invoke thoughts of small-time, hippie-ish pursuits, but the actual energy impact of indoor growers is on a par with humming data centers," according to a recent New Frontier study. To find a solution to the rising energy use, the city started a task force that looks at pot and power. After years of research, the task force is now recommending LED lights, which have a long lifespan and are more efficient than traditional bulbs. However, each light unit can cost hundreds or even thousands of dollars. That's why in some places, like Seattle, Wash., utility companies are offering generous rebates to businesses that change to LEDs – including pot growers. "It's cheaper for us to provide incentives to reduce energy usage at our customers than it is for us to put in new power plants," said Dave Montgomery of Puget Sound Energy in Seattle. Puget Sound's LED rebates cover up to 70% of new lighting costs. In Colorado, utility companies are offering rebates up to 40%. And the trend continues in Oregon. In fact, the Energy Trust of Oregon, an efficiency arm of several utility companies in the state, is also seeing an uptick in interest from marijuana growers, according to The Guardian. Marijuana companies are already making headlines by improving their communities, fighting the opioid crisis, and now contributing to the fight against climate change – and that is only going to lead to more cultural acceptance. Already, more than 61% of Americans think marijuana use should be legalized, according to the latest CBS News poll. The number – 61% – is the highest percentage ever recorded in this poll and a five-point increase from the previous year. "Marijuana advocates aren't finished with their fight. In fact, they're stepping up the pressure," according to Money Morning Director of Technology & Venture Capital Research Michael A. Robinson. And as the fight continues and legalization sweeps the nation, marijuana investors are making some serious money. "Call this the 'green rush,' where weed investors are pulling in profits hand over fist," said Michael. Michael is our renowned pot stock expert and one of our most prominent and respected investing "gurus" here at Money Morning – and for good reason. He is one of the top financial analysts working today. Make no mistake: Michael's ideas are completely his own. You see, there are thousands of legal marijuana companies out there, and picking the right ones for your portfolio can be daunting. That's why Michael's put together an exhaustive list of the best, most lucrative, and fastest-growing legal pot stocks in America. They're all in his 89-page "bible of weed investing" The Roadmap to Marijuana Millions. Three of the largest gainers in Roadmap have minted investors 164.38%, 251.8%, and even 300%. Reserve your exclusive, Money Morning Members-only copy today, right here. I am excited about the gains in marijuana legalization in the states that have legalized it. I am hoping for a better outcome after the next election in Oklahoma for govner . The legislature approved legalization, but our pro nanny law govener vetoed it. I think all drugs should be legal just like alcohol.